Winning with Wine! | TFI Envision, Inc.
Home / Archive / The News / Winning with Wine! New York, NY – For more than fifty years, Graphis has earned the respect of the global design community with work selected from professionals who are the best in the business. Today it continues to be a distinction for accomplished designers, art directors, illustrators, product designers and photographers to be included among the pages of a Graphis publication. It is with great pleasure to announce that Graphis has again selected Tom Fowler, Inc. to be included in their upcoming Graphis Poster 2006. Graphis receives thousands of entries from around the world to be considered for inclusion in this prestigious annual. 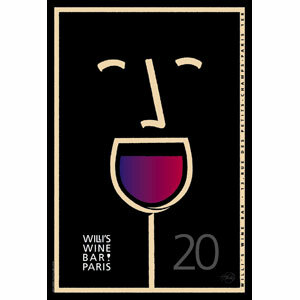 The piece that will be featured from Tom Fowler, Inc. is the Willi’s Wine Bar Paris 20th Anniversary Poster.